Trying to find a way to live on jam and pickles alone. And probably putting them in a cocktail. What a strange winter we’re having. It’s snowed only twice. I mean, actual accumulation on the ground snow – not wintry mix quasi flurries freezing rain stuff. Twice. Once during Snowtober, once last week. Its a running joke that I have reverse seasonal affective disorder – but not in 2012. I’m just as cranky as the rest of you this year. Cranky for a bunch of reasons, but also cranky because of my pantry. It’s the same old story – too much jam. Too many pickles. Not enough other stuff. Typical, but still frustrating. Luckily, I stashed away some fruit in the chest freezer. (It even survived Irene!) I’m even luckier, as I have the California secret weapon to eliminate all winter crankiness. Its guaranteed to cure what ails ya this time of year. I dare you to breathe in the scent of fresh-picked meyer lemons and not feel instant relief from the winter blues. I was introduced to Karen’s fabulous lemons last year, and I am as hooked as ever. Before I order this year’s batch, I’ve promised myself to finish last year’s. That’s right – lemons I ordered a year ago – preserved in salt and spices since last February. Smoked paprika, cayenne, sugar, cinnamon, salt, peppercorn and bay leaf have worked their magic and transformed the meyers into something completely different. These lemons are my favorite use from last year – they bring an an amazing amount of flavor. Blueberries and lemon are one of those epic combinations – and this compote is no different. Best served over ice cream or yogurt, this recipe is definitely a keeper. Combine all ingredients over medium-low heat. 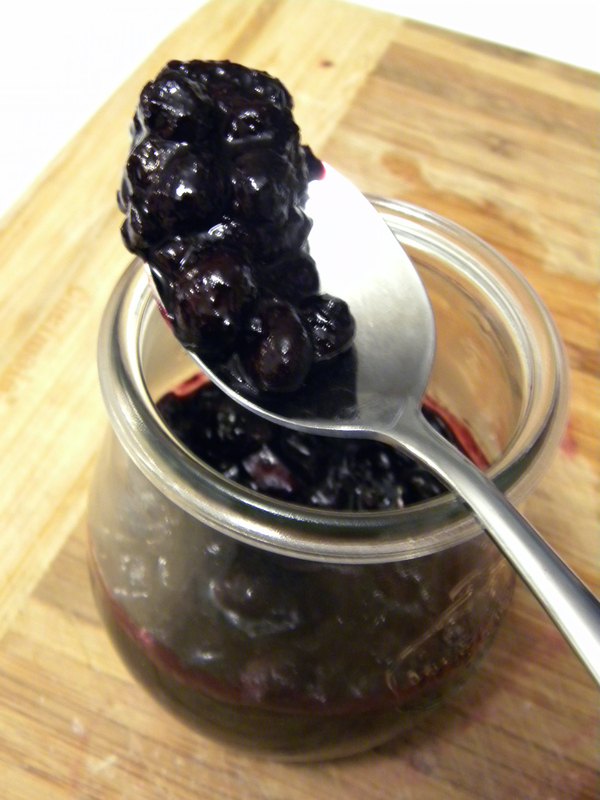 Cook until it reaches desired consistency – but be careful – blueberries will set up quickly. 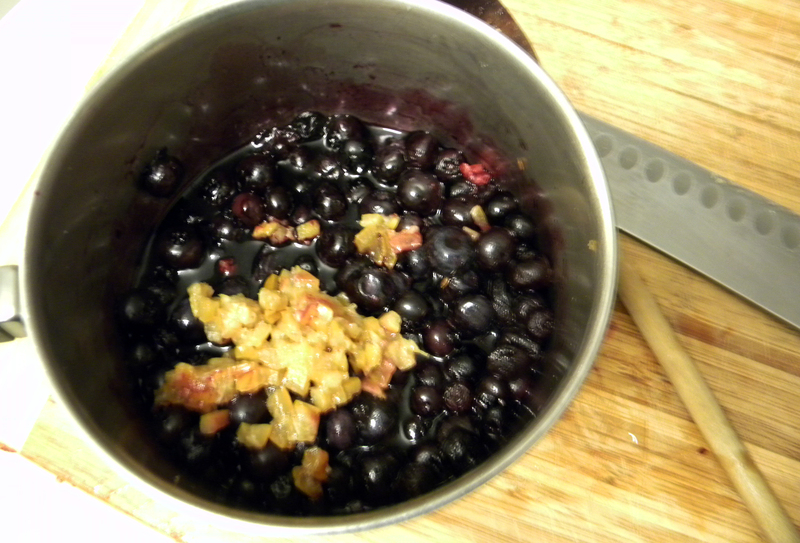 If you’re feeling impatient (ahem) mash the blueberries to speed up the process. Remove cinnamon to serve. This will keep well in the fridge, though I am equally sure it would transition well as a shelf-stable recipe with the addition of a little lemon juice. To help cure your winter blues, Lemon Ladies Orchard has offered a meyer lemon gift bag to one SK reader. Let me know how you beat winter crankiness – leave a comment with a valid email address below to enter. Giveaway will end at 11:59pm on Saturday February 4. This entry was posted in giveaways, preserving on January 29, 2012 by Kate @ Snowflake Kitchen. Citrus marmalades, canning citrus slices, planning spring and summer canning……Oh, I just purchased 4 Meyer lemons this weekend….my first purchase for these beauties. Thanks for offering this giveaway. I beat winter crankiness by going skiing, but I suppose if I’m thinking about it from a culinary sense I make myself a nice soup with lemon (I’ve got an amazing recipe, if you’re interested). Or candied citrus peels. Yum! Definitely marmalades…..I adore nothing more than the smell and feel of citrus heating up when its chilly outside. I’m also defrosting the last of my Maine blueberries (not wild-alas) so I may just make this tonight….I’m also working on some pickled watermelon rind, got a great melon for cheap last week. We’ve only gotten three snows here as well. Which is super odd. I mean it was 50 degrees on the way to work the other day. In Maine. In January. No wonder our growing zone went up again…..dang climate changes. I take advantage of the winter by going snowboarding! Love the speed and it’s a great workout. It makes me want winter everytime summer rolls around! Organizing and cleaning always seems to help me. Keeps my mind off the weather! I melt good chocolate in the double boiler, add milk, and curl up in front of the wood stove in the basement on cold winter nights (like the ones we had last year). This year, I’ve taken advantage of the warm weather to run off the blahs. Ok – bacon and limoncello cure all ills. I stand corrected. doesn’t that look beautiful! to beat the blues, I bake pumpkin bread & pb cookies for my husband, make vats of marmalade and curl up with books whenever possible. 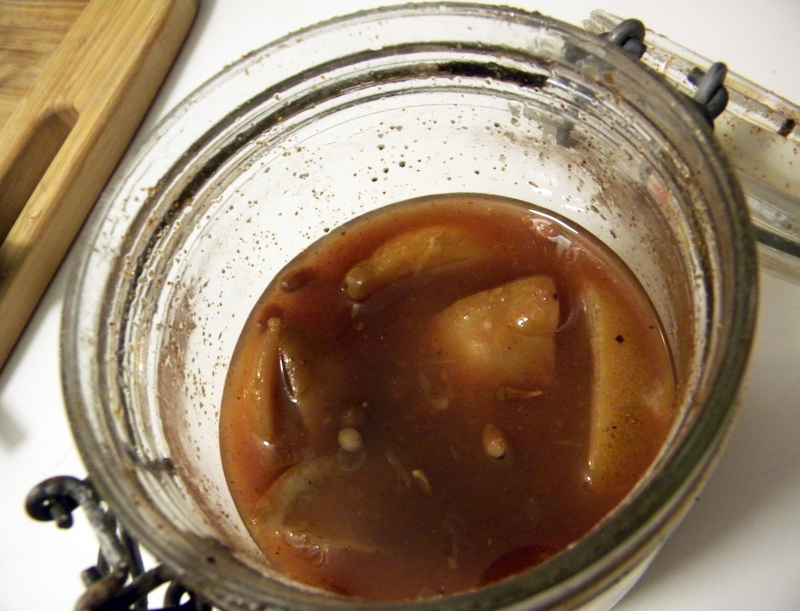 To beat the winter blues, I eat plenty of lacto fermented foods – sauerkraut, yogurt, kefir (now water kefir! ), kimchi, and more. High in vitamin C, fermented foods also make me feel happy because my body feels all aligned. Love it. I work in the greenhouse and enjoy the heat and light there. Oooh, citrus of any kind brightens up my winter. I grew up in Texas citrus country, with lime, orange and grapefruit trees in the backyard. Now? I live in the mountains of SW VA, where I’m LUCKY if they have fresh limes and lemons at the grocery. Forget about any special varieties. For my winter blues – I do yoga in front of the wood stove, or if it’s sunny, bundle up and enjoy the sunshine while my nose slowly goes numb. And appreciate that it’s only a few months until we’ll be in a new season! Today it is going to be 72 degrees in East Texas and I HATE it. I am a major detractor of the sweltering summer and the humid spring so I am completely furious that I am being denied a proper winter…well, as proper as you can get down South…So this winter, I am beating the crankiness and defrosting strawberries for a strawberry Meyer-lemon marmalade. If I can’t be frozen, neither can they…! We are lucky we live in Colorado so we have many sunny days. Right now to make it to spring I plan plan and plan some more for our garden. I started canning last season because my husband was tired of giving away our surplus now I’m so hooked. In order to beat the winter blues I spend as much time as I can in the kitchen. Lately I’ve been putting up marmalades and curds. I also like to peruse all my canning, preserving and cookbooks looking for those out of the ordinary recipes, and for recipes using all the fruit and produce I’ve preserved. I also compose lists of what friends and family seem particulalry fond of so i can make sure I preserve enough for next year’s holidays. Lemon curd and lemon preserves are always on that list, although my Red Onion Relish (which a friend tells me should technically be titled a marmalade) is very popular also! I am thinking a homemade limoncello would beat my winter blues! Carmen – homemade limoncello cures all ills. Carmen, the random number generator chose you! Check your email. An engrossing cotimnicaumng is couturier opinion. I think that you need to make much with this topic, it is probably not a bias subordinate yet generally everyone is not sufficiency for you to talk about such subject areas. To the succeeding. Cheers similar to your Khmer Karaoke Superstars » Somnangblogs. I eat all the wonderful summer bounty that I canned. But seeing as it’s in the 70s today in Austin, there really aren’t a whole lot of winter blues to conquer. It’s hard to remember what I usually do to beat winter crankiness–we’ve been having weather in the 50’s and 60’s this week. Not normal for Iowa this time of year. But I vaguely remember relying on good soup and hearty stew recipes I can make in the crockpot so they’re ready as soon as get home from work. I beat those winter blues with my trusty wooden spoon! Haha! This bread baking, chili steeping, jam smoothering, Mama of five always invites friends over to sample my newest creations. Oh, chocolate and wine helps a lot too LOL! Thanks for the opportunity to win some lemons! Oh, lemons would be so much fun to experiment on! this year, it’s been with a surprise litter of puppies, and a high of 82 yesterday! Where IS winter? My winter crankies are being helped this week by a jar of homemade peach jam from last summer! It was my first attempt a “real” jamming and canning, and I have to say I’m looking forward to canning on a much larger scale this coming summer! Mmmm… those summer peaches. Well, it’s hard to get the winter blues in Florida.. but if I do love to open a fresh jar of jam made from ripe summer fruit to enjoy with a cup of tea and a good book in my sunny Florida room! I give myself a moisturizing facial using some great products (I use Eminence, all natural and FABulous smelling) and just let the scent steep in my nose as the products work their glory on my dry, winter-blah skin. AND…I dream of my garden in the spring. Lemon squares & strong coffee beat the winter blues (especially this Year of No Snow). Summer nastiness is much harder to beat! My winter blues would go away if it would snow!! I don’t mind the cold as long as we have beautiful fluffy snow to look at and play in. Beating the winter blues isn’t too tough to beat, as long as I’m in the kitchen baking up something that includes either cranberries or pumpkin! Yum! Lemons always brighten up winter. And you can’t beat the blueberry-lemon combo! What a great giveaway! My ways to beat the winter blues: cross country ski or snow shoe BUT this year is very warm, so I’ve headed towards the ‘make DIY food projects’ direction- especially by making liqueurs- like coffee… then of course, drinking it post-toddler bedtime, in bed watching Fringe with the hubs! writing cards (how old fashioned….!) & making anything with blood oranges (swoon!)…. I try to go to yoga throughout the winter to keep my spirits up. I go cross-country skiing – it’s a good way to remind myself of the things I enjoy about winter. I love the combination of blueberries and lemon. Next year I think I’ll freeze some blueberries just to have some for a winter jam! Well, here in central Texas we have quite mild winters. This year in particular has been “mild” to say the least – I think we hit 82 degrees earlier this week! I recently discovered the joys of canning so I’ve been trying to do something new and fun every week or so. And it has helped me beat any winter crankiness – I love prepping produce, sticking it in a pot, and see what happens! I’m happy to see that there is something I can do with the blueberries in my freezer – I’ll just have to figure out what to sub the preserved lemons with since I have not attempted those yet! Thanks for the post and the chance to win some Meyer Lemons! When crankiness sets in, I pull out the frozen blueberries we picked from our own blueberry bushes we planted last spring! Blueberry pancakes, syrup, ebelskivers, you get the idea!! This spring I will be adding more bushes and will be able to have enough blueberries to make jams, and lemon and blueberries go together so well in my mind!!! I chase the winter blues away by pulling out something fun I canned at the height of summer for a snack, make some lemonade and flip the pages of the newest seed catalog and dream of summer! I’ve been cranky too. I think a little lemon love would be just the thing. Thanks for a great giveaway! Here in ND, it’s an odd winter, too. We FINALLY got some snow that sticks, But I’m still crabby, I want my garden! This winter, I’ve really started to do some major canning with winter squash, pumpkins and some wonderful jams. It’s been a big relaxation to hear the jars “ping”. content here. Your website should go viral. You need initial traffic boost only.